QPaint offers a professional painting service for the body corporate in Brisbane, Gold Coast, and the surrounding areas. We have provided this service for over 35 years and as a family owned and operated company can be trusted to get the job done right. Our specialist Body Corporate Team will communicate with all the parties involved from the body corporate, real estate agents, owners and tenants. We provide a free quote service and get the price to you promptly. Our team of painters have experience and skill in building restoration with paintwork. The work we do includes exterior building paint, interior building paint, roof paint restoration and all areas in-between. Free 90 Day Touch Up Guarantee – If the paint is accidentally scratched, dented or damaged, we will touch it up for free in the first 3 months. When working on a Body Corporate project our Team understands the many variables that we need to take into account. Several parties can be involved and have a stake in the outcome. If the building is occupied during the paint project we promise as little disruption to daily life as possible. We don’t want you fielding complaints from angry owners and tenants. This is why our skill and experience is important. We can project manage to make sure we work fast and efficiently with as little day to day impact as possible. Our team delivers a fast outcome whilst maintaining high quality paintwork. It is no good to have a Body Corporate project completed quickly but at a poor standard. We promise both outcomes of efficiency and quality. All of this with a price that you can afford. In the colour consultation process, we provide a huge variety of colour selections from Australia’s leading brands to choose from. Exterior building paint colour is very important to get right. It affects the whole look of the façade. Getting it right will go a long way to increase the value of all the individual apartments, as well as the building as a whole. It attracts buyers and renters and guarantees a quick turnaround for sales and leases. Our colour consultant team is very experienced in Body Corporate projects. 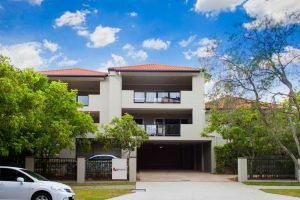 We look at your building, the area and take into account the Queensland climate. We make sure your paint is going to stand up to the weather and also provide energy efficiency. When done right, a roof restoration and paint can save up to 60% of air conditioning bills. We use a heat reflective membrane paint that eliminates 90% of infrared reds and 85% of ultra violet rays. In the colour consultation process, we provide a huge variety from you to select from. We can guide you in the process and in the end, make sure you are completely satisfied with your choice. Avoid loss of rent due to slow Contractors and make sure there is as little disruption as possible, if your building is tenanted. At Qpaint we always provide exceptional customer service and quality paintwork. Speak to our specialist Body Corporate team today and discover our professional service at affordable prices.